Many web hosting companies offer free script and CMS installation. In most cases, the installation is automatic and done through the host’s control panel system. 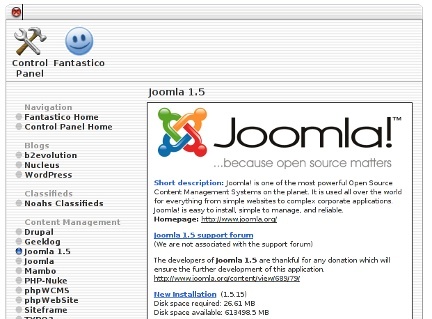 For example, users of cPanel might have an option for Fantasico De Luxe, which installs a number of web applications, such as Joomla, WordPress, and OS Commerce. 1. Does the provider’s service provide updates for the scripts? 2. Are they standard installs that can be modified the same way a manual install would? 3. Is the software open and common so that if the user decides to leave that host, they can take their data and design elsewhere? 4. What type of the support does the host offer for these third-party packages? Depending on the answers to these and other questions, you may decide to use your web host’s services or install the applications you need on your own. Previous Google CEO: "[W]e can literally know everything if we want to"